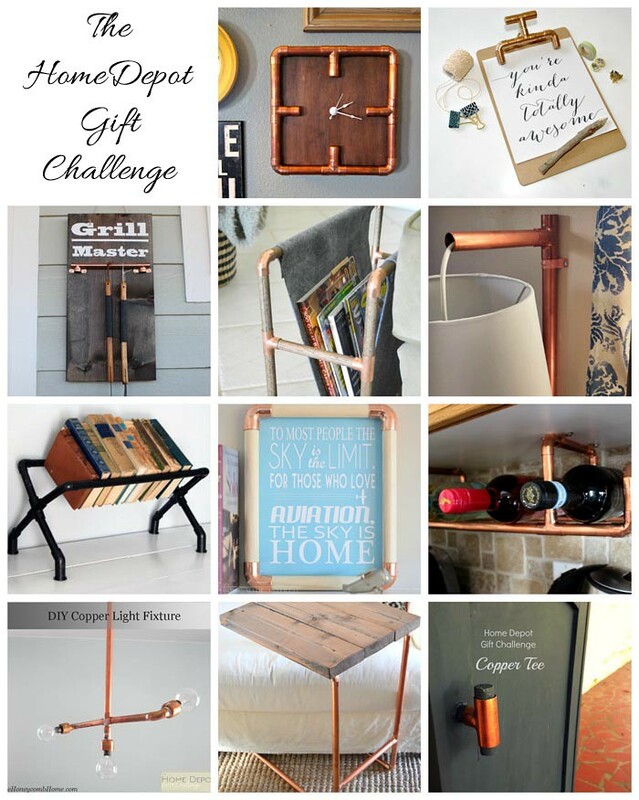 I love a challenge and I also spend a lot of time at Home Depot. So, when I had the opportunity to join 11 amazing bloggers for a DIY/Craft challenge involving an item purchased from Home Depot I was stoked. So here is the deal, each month we bloggers are presented with a hand picked item under $10 and we have to turn that item into something that could be used as a gift for someone. (Our challenge is not with Home Depot- we just heart their products). For February the item is a copper pressure tee and I the gift will be for my husband. First let me say that the plumbing isle of Home Depot is a great place to get your creative juices flowing. Copper, Metal, Plastic in all shapes and sizes. 1. We are moving and have been going through our possessions trying to decide what we want to keep, donate or toss. I did not want to add anything to home that we will have to move in a few weeks. 2. My husband had a pitiful bedside table. Really sad, we could not fit two normal bedside tables in our bedroom. So, I have a nice bedside table and David had this. This guy was purchased from Target about 8 years ago to help with storage in our previous master bathroom. It was missing it’s handle and you have to carefully stick a coin in the cabinet door and pry it open. I decided to give this tired piece a facelift and most importantly a handle made from a copper tee. At Home Depot I picked up my copper tee and a wood dowel. I inserted the dowel through the copper tee and marked and cut the dowel. I wanted a little bit of the dowel to show on both sides of the tee and a small piece to act as a surface for the screw to attach. P.S. don’t judge me on my rusty saw, my tools are all packed away and I found this guy in the attic. To give the entire piece a facelift I applied two coats of Martha Stewart’s Vintage Decor Paint. I also painted my little dowel pieces. I inserted the larger painted dowel and then added gorilla glue to center. I inserted the small painted dowel and attached it to the large dowel with the glue. Using the same hole from the previous handle, I used a long screw to attache the new handle to the piece. The last part of the challenge is to wrap the gift in something from Home Depot. Now before you go, check out what amazing projects that the other bloggers came up with this month. I love all of their brains and creativity. Great transformation! Love how the handle turned out! Such a great way to give new life to an older piece of furniture (I love the paint color, too)! Pinning! I want paint everything that color. Thank you! This came out great, what a difference from the before! Your transformation made a world of a difference! this is awesome! So simple and chic! It was easy peasy. Thanks Lindi! Wow what a transformation! Love the chalky paint and the touch of copper! I can’t believe that’s the same piece of furniture!! The copper looks so great against that paint color. And yes, you had plenty of HD to “wrap” your present in, huh? Thanks Emily! Yes, we have plenty HD boxes to “wrap” everything . You can’t go wrong with Grey and Copper. Thanks! This makes such a pretty pull for a cabinet. Great idea! Stumbled across your blog via Bre @ Brepurposed. Glad I did, love it. This copper handle is a genius idea and the color is awesome. I am so glad you stopping by Lemon Peel! I am glad you like my copper handle. Oh this is awesome! So clever to use it as a handle, and I love the pop of color it gives the piece! I love the color you painted it, too. Paper & Fox – your new favorite place for Crafty Projects + Clever Ideas. Painting a Stone Fireplace....Finally, I Did It. © 2019 Paper & Fox. All Rights Reserved.